Online Message Boards – While the online forum or message board is largely viewed as a dying medium in many Internet-savvy circles, there are still boards catering solely to niche groups that boast a thriving community. Nannies may find that these dedicated forums are an ideal way to connect with others in their profession to speak candidly with, especially as the format lends itself almost effortlessly to something akin to anonymity. Nanny Organizations – There are plenty of nanny organizations available on the local, national, and even global levels. The most famous and perhaps the most reputable, the International Nanny Association, even hosts an annual conference for nannies to meet up, continue their education, and discuss relevant topics. Joining an organization is not only great resume dressing, but can also help you connect with other private childcare providers to share insights and battle stories. Outings – The group of nannies gathered at the park as their charges play is such an iconic cultural image that it’s become ingrained in the collective consciousness, and for good reason: meeting up with other nannies while the charges engage in physically active play outside of the home and off of the couch offers private caregivers the best of both worlds. Charges are engaged and happy, in the company of other children, and building their own social skills, while you’re able to find a much-needed social outlet as you supervise free play. Request a Contact List Through Your Agency – If you obtain placements through the services of a local nanny agency, they may be willing to provide you with a contact list of other nannies in your area in order to facilitate socialization and a sense of camaraderie among their nannies. Check with the agency you work through for such information; be warned, however, that most agencies will be loath to provide such a list to any nanny that didn’t use their agency themselves for confidentiality reasons. Take Advantage of the Blogosphere – In addition to the thriving social media groups and online message boards, popular nanny blogs that feature a prominent comments section are hotbeds of communication and idea exchange online. Many of these blogs are dedicated to frank discussion of the challenges that nannies face as well as a celebration of the more fulfilling aspects of the profession, allowing a good balance of honest discussion. Look For Local Meet-Ups – Local meet-up groups aren’t just dedicated to speed dating and matchmaking; these days many major cities actually have organized childcare provider and nanny meet-ups designed to allow nannies a chance to connect with one another and form relationships with others who share their passion for providing top-notch childcare. Arrange Play Dates – Asking your employers about friends or relatives that they may have with children in the same age group as your charges who also utilize nanny care can be a great way of meeting other nannies! This allows the kids under your care a chance to play in an intimate setting on a smaller scale than that of a large park or playground, while you share grown-up conversation with another childcare provider. One of the scariest things about hiring a nanny is the thought that your child will not like her and will be miserable under her care while you’re away. When your child is still a toddler there’s a good chance that she won’t have a strong enough grasp of language skills to give you a detailed account of the time that she spends with her nanny, leaving you on your own to determine much of how she feels. If your nanny arrives just before you leave the house and is out the door as soon as you walk in, evaluating the relationship she’s formed with your child can be even more difficult. Read Behavioral Cues – Observing how your child behaves when her nanny arrives or leaves is an effective method of gauging her feelings about the situation. Refusing to engage with her nanny when she arrives, fleeing from her when you return home, and showing little interest in any sort of goodbye at the end of the day might be an indicator that she’s not warming to the nanny. If your child is particularly prone to separation anxiety and has trouble when you leave the room, however, this method of evaluating the situation might not be as effective for you. Watch Them Interact With One Another – Ideally, your nanny will report to work early enough that you can observe how she interacts with your child before you leave and will remain in your home after you return to give you a summary of the day. It’s natural for your child to be more interested in your presence than that of a new nanny, but if she seems standoffish or hesitant to engage with the nanny, it could be an indicator that their relationship isn’t developing well. Ask Verbal Toddlers Questions About Nanny – While even verbally gifted toddlers aren’t likely to be advanced enough to offer you a discourse on the nanny’s methods and temperament, a few pointed questions posed to a toddler with some verbal acuity should give you a basic idea of her feelings regarding her nanny. Keep in mind, however, that a toddler isn’t always able to distinguish fantasy from reality and may inadvertently tell some tall tales along the way. Keeping your questions direct and to the point is the best way to make an attempt at uncovering your child’s feelings toward her nanny. Talk With the Nanny – Setting aside a bit of time each evening to ask your nanny for the highlights and big events of the day will allow you to get an idea of how they spend their time together, and how the relationship between them is progressing. An experienced professional will almost certainly address any issues regarding trouble they may be having in terms of establishing a bond, and may offer her own suggestions for ways that the situation might be remedied. A nanny that seems disinterested in your child’s opinion of her, however, simply may not be making any effort toward establishing a connection with her charges. Follow Your Instincts – Ultimately, no one knows your child as well as you do, even if she’s not able to verbally express herself very clearly. Following your own instincts regarding the nanny and any relationship that they may or may not be forming is one of the best ways to establish your own peace of mind in regard to the situation. If you don’t feel right about your nanny and suspect that your child doesn’t either, it may be best to end the relationship at the end of her trial period. While it’s certainly disheartening to think that your child is being cared for by a nanny that she doesn’t like, it’s not necessarily cause for immediate concern or alarmist behavior. A personality clash is rarely indicative of abuse, and may resolve itself as your child becomes more accustomed to her nanny. This especially holds true if your child has never been cared for by anyone outside of her family or is mourning the loss of a beloved former nanny. Assuming that there are no signs of abuse and your nanny seems to be genuinely trying to win your child over, it might be best to take a wait-and-see approach before making any rash decisions. Some children are simply wary of new caregivers and require more time to adjust to a new situation than others. One of the advantages of hiring a nanny is that nannies typically provide care for mildly ill children. For parents who can’t make a habit of calling into work sick, knowing that they don’t have to worry about daycare sick policies or that they don’t need to arrange last minute back-up care is a real tangible benefit. Parents who know that their child is well taken care of when they are mildly ill are able to reduce the number of sick days they take, alleviate the stress associated with trying to find back-up childcare, and feel more at ease when staying home to care for their child that does need their care and attention. While there is no concrete definition of what constitutes a child being mildly ill, most parents know when their child needs to remain in their care and when it’s appropriate to ask their nanny to care for a sick child. Parents and nannies should regularly communicate about the health of the children. This often means a parent calling or texting their nanny after hours to make her aware an illness has developed. This not only provides the nanny an opportunity to provide any valuable information about the child’s behavior or mood that, in hindsight, could have pointed to a developing illness, it also starts the dialogue for developing the sick care plan for the next day. Parents and nannies may have a differing of opinion on when it’s appropriate for the nanny to come into work to care for a sick child. If a nanny could become ill herself, for example, she may be less enthusiastic about caring for a child who has the flu. Parents and nannies should work together to determine when it’s appropriate for the nanny to provide care. If it’s determined that the nanny will provide care, it’s important that a concrete care plan is in place. Should the nanny be required to administer medication, written instructions and permission should be provided. If the nanny will need to schedule a doctor’s appointment or take the child to the doctor’s office, the parents should be sure that there is a medical authorization form on file with the pediatrician’s office and that the pediatrician agrees to allow the nanny to bring the child to his appointment. 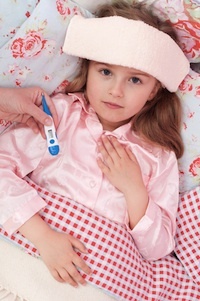 Parents and nannies should have a plan in place for when a child becomes ill during the day. This plan should include when to call the parents at work and how to best reach them, when to call the doctor, when to dispense medication, and the necessary permission and instructions to do so. Nannies should always be encouraged to contact their employer at any time, should they have any concerns about the child’s health and wellness. If the parents know in advance that they cannot easily be reached, the parents should provide clear instructions on what the nanny should do in the event the child becomes ill. Some parents give their nanny permission to call the nurse’s line at the pediatrician’s office or schedule doctor’s appointments should they deem it necessary, and others prefer that they contact their work office and insist that they be tracked down. For school aged children, parents and nannies should have a plan in place for when the child becomes ill during the school day. Often times the school nurse will call the parents and if the parents can’t be reached, will call the emergency contact, which is often the child’s nanny. For parents who employ nannies for their school aged children, it is important to discuss the nannies role and responsibilities during the hours when the child is in school. If the nanny is required to be available as part of her job description, it should be clear how far the nanny can travel from the home during the school day and what the plan of action should be should the school nurse calls her to pick up the child from school. When parents and nannies work together to develop a care plan that everyone is comfortable with, the mildly ill child will receive the proper care and attention from whomever is providing care. Having a written nanny and family work agreement that outlines what constitutes when the child is mildly ill is the first step in developing a sick care plan. Providing their charges with frequent opportunities to socialize with other children is a high priority for most professional nannies. Whether it’s visiting parks and playgrounds or attending library story hour, professional nannies make a conscious effort to provide rich social experiences for the children in their care. 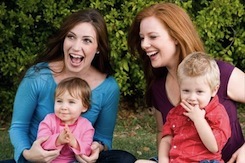 One of the most common social experiences that nannies introduce their charges to is playdates. By getting together with other parents or caregivers and children of similar ages, the children learn to master social skills, like sharing, interacting with peers and problem solving. But hosting a successful playdate takes a little planning and preparation. These 5 playtime principles can help nannies plan a practically perfect playdate every time. 1. Schedule the playdate carefully. When planning a playdate, it’s essential to schedule it during a child’s peak time, which is typically after a morning nap and snack for young children. This is because well-rested and well-fed children naturally make better playmates. When these two basic needs are met, children are able to focus their energy on playtime and invest their internal resources in emotionally managing the social experience. Since young children physically and emotionally wear out easily, playdates should be limited to no longer than two hours. 2. Provide age-appropriate activities. Having age-appropriate activities available during the playdate will reduce frustration and provide opportunities for both parallel and interactive play. Having a playdate theme, like “the farm,” and choosing books, crafts, toys, and music that reflect the theme can ensure that there are a variety of related activities to participate in. Toys like Little People, blocks, and other items that encourage several children to play work best for playdates. 3. Have a snack ready. As soon as blood sugar levels sink, bad behavior shortly follows. Having a healthy snack, like fresh fruit and string cheese, on standby can assure that you are prepared if your charges or guests become hungry. Snack time can also provide for a much needed break from activity, should the playdate turn chaotic. 4. Have house rules. One of the best ways to set the children up for success is to clearly communicate the house rules. The house rules are basic rules that are typically universally accepted by all parents. “We use our kind words and hands” could be included in the house rules for the younger set. For young children who can’t yet understand or always follow the rules, blocking off areas that aren’t for play, removing items that are breakable or dangerous, and distracting children before trouble occurs can help set the children up for success. For older children who may play a bit more unsupervised, keeping doors open, staying off of the computer, and not using swear words could be appropriate house rules. 5. Encourage the kids to work it out. Playdates provide an opportunity for children to practice playing with others, getting along, and resolving conflict. When children are having trouble sharing, try to avoid intervening, unless someone is at risk for getting hurt. If you have to intervene, modeling problem solving by helping each child take turns communicating their feelings can be effective in helping young children learn how to solve problems. For younger children, distraction or removing a trouble causing toy can be most effective. Often times, nannies wonder if it is appropriate to discipline someone else’s child. If the child is in your care during a playdate, without the parent or caregiver present, disciplining the child is typically appropriate. Asking the parent or caregiver what techniques they use prior to caring for the child can ensure that you follow the parents or caregivers wishes when it comes to discipline. When in doubt, redirection and offering general correction to all children, like “Let’s remember, we must share the toys” can be effective. Asking the offending child to help you solve the problem, for example, “Ben, can you show me how to share the truck” can also work well. If the caregiver or parent is present, it’s always best to allow them to discipline the child. If the parent seems unresponsive to bad behavior, however, asking for the child’s cooperation (Sara, could you move away from the slide so Lyla doesn’t hurt you coming down) can be effective. If that fails, asking the parent or caregiver directly to intervene should curb the behavior. Learning to get along with others is a key life skill. Nannies can help children develop the social skills necessary to play with others well by regularly hosting playdates. Whether your child has their own peanut allergy, attends a peanut-free school, or sits at a designated peanut-free table in the cafeteria, finding school lunch options that don’t include this highly allergenic kid-favorite is a difficult, albeit necessary, part of the lunch packing process. The 30 blogs mentioned here all feature sure-fire hits of the peanut-free variety. The sandwich, regardless of variety, is a lunchbox staple for the elementary school set. Often, however, the most popular options feature peanut butter as a primary ingredient. These five blog entries are packed with sandwiches sans peanut products, giving parents and caregivers a wide array of ideas to keep kids happy and healthy. Parents and caregivers of kids who attend peanut-free schools, but don’t suffer from a peanut allergy themselves, are often surprised by the staggering number of everyday dessert options that unexpectedly contain trace amounts of peanuts. These five blogs break down the dessert section of your little ones lunch box, with hints and tips for how to keep them both tasty and compliant. Dirt Cake Recipe! Peanut-Free Dessert Idea! Kids love snacks and main courses that they can eat with their fingers, but many commercially available, pre-packaged snacks either contain peanuts or are processed in a facility that also processes peanuts. For snacks and finger foods that you can pack in a child’s lunch without worrying, these five blogs are invaluable sources. Sunbutter is a peanut-butter substitute made from organic sunflower seeds that are processed in a highly controlled environment. The manufacturers of this hot product understand that much of their popularity is based on their allergen-free status, and make a point of carefully maintaining it. These five blogs feature sunbutter in all of its glory, with lunch options extending far beyond the traditional PB&J. Another popular option in the peanut butter-substitute arena is soy-nut butter, which can be an ideal choice for kids that don’t also have sensitivity to soy products. These five blogs offer creative meal ideas using soy-nut butter. Adhering to a peanut-free regimen for school lunches can be a complicated task for parents that have never before tackled the issue. 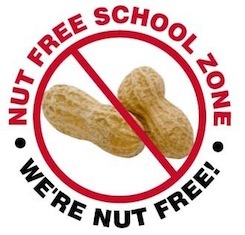 For these compliant parents without allergic children, any hints and tips can go a long way towards dispelling incorrect safety notions and providing creative, peanut-free alternatives. Thankfully, these five blog entries come to the rescue. Whether it’s due to modern day reality shows like Beverly Hills Nannies, old school movies like Mary Poppins, or the perception the media shares with the public, when it comes to nannies, there’s definitely a mix of both fact and fiction. 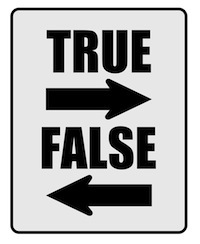 Here are 10 of the most popular myths people believe about nannies. 1. Nannies are only for the wealthy. While nannies may out earn daycare workers, for dual income families, parents who demand extended and flexible coverage, and families with more than one child, nanny care may actually be a cost-effective childcare option. With a nanny you’re the boss, you pay per family rather than per slot, you make the hours, and you don’t have to pay by the minute if you’re running a few minutes late. 2. Kids cared for by nannies aren’t socialized. Professional and career nannies assume the responsibility of providing rich social opportunities to the children in their care. In fact, nannies have more freedom to socialize children than daycare teachers. In addition to national networks of nanny groups that connect nannies and facilitate play dates, nannies take their charges to mommy and me type classes, story hour at the local library, and on other age-appropriate outings to mix, mingle, and form friendships with other kids. 3. People are nannies because they can’t do anything else. Most career nannies will tell you that they can’t imagine doing anything else. While nannies have diverse backgrounds as educators, psychologists, nurses, chemists, moms, and more, there’s one thing professional, career nannies have in common: they do the work because they love it, not because they can’t find work doing something else. 4. Nannies have to be certified, like teachers. While many private colleges, career schools, and even online learning centers offer certifications for nannies, there are no across the board certifications or licensure for nannies. Nannies don’t have to be licensed or certified to accept work. 5. Nannies only live with the families. While years ago most nannies may have lived with their work families, that’s no longer the case. Most nannies live in their own homes and commute to their employer’s home each day. 6. Nannies are independent contractors. Even those in government can’t seem to always get this one right. Nannies are not independent contractors. They are the employees of the families for whom they work. As such, both nannies and employers have legal and tax obligations. While there are some exceptions, such as if a nanny earns less than $1800 in a calendar year, 99.9% of nannies are employees. 7. Nannies are from other countries. Many people believe that nannies are not from the United States and that a nanny and an Au pair are one and the same. This simply isn’t true. Au pairs enter the United States through the U.S. Department of State Travel and Tourism Bureau Cultural Exchange Program. In exchange for living with a family and experiencing American life, they provide limited childcare. For nannies who wish to enter the United States and work as a nanny, the process isn’t a short, inexpensive, or easy one. Nannies must be able to legally accept employment in the United States to secure a post. So contrary to popular belief, many nannies are born and bred in the USA. 8. Anyone can be a nanny. While anyone may think they can be a nanny, it takes a special skill set and personality to be an in-home childcare provider. Nannies must have a general knowledge of children and childcare principles, have a genuine love for children, and be able to work without close supervision. Nannies must also be reliable, dependable, and trustworthy. 9. Nannies are just babysitters. Hearing this myth stops a career nanny dead in her tracks because it couldn’t be further from the truth. Babysitters provide supervisory care and are responsible for keeping the children safe while their parents are away. Nannies provide coordinated care and are hired to partner with the parents in raising their children. As such, they are concerned with the children’s social, emotional, and physical growth and development. 10. Nannies cook and clean for the families. Nannies are generally responsible for undertaking all tasks related to the care of the children. While this typically includes doing the children’s laundry, picking up after themselves and the children, and keeping the children’s areas neat and clean, unless specified and agreed upon, nannies don’t prepare meals for the parents, do the parents laundry, or clean the family’s home. While each family and nanny relationship is different and is tailored to the family’s individual needs and preferences, there are definite standards that separate fact from fiction. While a nanny may work in the family’s private home and outsiders may view her as being there 24/7 with no life of her own, the reality is most nannies are childcare specialists with active private lives of their own. One of the hottest parenting trends today is giving children language instruction beyond that of their primary, native tongue. Because speaking more than one language can be beneficial academically, can affect the college admissions process, and can help determine a child’s career trajectory upon reaching adulthood, parents are more determined than ever to help their kids reach bilingual goals. There are several methods for boosting kids’ linguistic aptitude; here are five of the most popular right now. Polyglotism – For some parents having a bilingual child isn’t enough; many modern parents are teaching their children to speak two or even three languages in addition to the child’s native tongue. Operating under the theory that childhood is the ideal time for instruction in multiple languages, these parents are invested in producing polyglot adults that speak effortlessly in several different tongues. While this approach can be very time consuming and difficult to follow through with, the benefits of speaking fluently in a variety of languages at a very early age are undeniable. Immersion – Immersion language instruction methods are mainly done in these two ways: they are either built around the premise of splitting instructional time evenly between a child’s native tongue and her second one for partial immersion, or they receive full-time second language instruction in classroom settings for full immersion. This method is accomplished often by parents whose children are too young for school or whose schools don’t offer second language courses by employing a nanny, Au pair, or other childcare provider that speaks only the second language to a child during her working hours. Parents then take responsibility for instructing their child in her primary language. Sign Language – Spoken languages aren’t the only thing at the top of parental to-do lists these days; sign language is all the rage for progressive parents. Whether intended as a method for communicating before a child becomes verbal, as a means of communicating with hearing-impaired friends and relatives, or simply to provide a child with the skill set necessary to speak conversationally with someone whose abilities are different from their own, sign language as a second language is a very popular parenting trend. One Parent, One Language – Children whose parents have different primary languages often learn to speak each language with equal fluency by learning via the “One Parent, One Language” method. Parents that adopt this method of language instruction speak to their children solely in their native language; as such, the child grows up absorbing the sentence structure, vocabulary, and pronunciation of each language as spoken by a native. This unbiased approach to language instruction can be very effective; while they may become verbal a bit later than their single-language peers, they can have a superior grasp of both languages when they do begin speaking. Accelerated Integrated Method – The Accelerated Integrated Method, also known as AIM, is a method of childhood language instruction that is built around the idea that kids learn and retain more of their second-language instruction when they connect physical actions with their words. For instance, a child learning to say “look” in her second language would then pantomime the action of holding binoculars to her eyes, thus connecting the word for “look” with the action of looking. AIM also integrates dance, theater, and music with language instruction, making it a perfect choice for kids that have a love of the arts. Some students respond so well to a few hours a week of AIM-based instruction that their fluency level rivals that of their peers in full-immersion programs; depending on a child’s individual learning style and temperament, it may be the ideal method of second-language instruction. The most effective method of teaching a child to speak more than one language is the one that suits her individual needs; just as no two children are exactly alike, no two language instruction programs will have the same level of effectiveness. 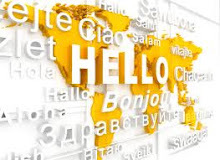 In today’s increasingly global economy and a “shrinking” world of connectivity with fellow humans around the globe, the ability to comfortably and confidently speak at least one language apart from English can give students and young adults a considerable competitive edge over her peers and, later, her coworkers. Whichever method that you choose, it’s important to be fully committed to helping your child master her second language, as she will require the support and assistance of her parents and caregivers in order to absorb and retain it. Boasting more than 7,500 acres of park, two well-respected conservatories and twenty-six miles of lakefront, Chicago is a cosmopolitan city with plenty of bucolic hideaways. With scores of museums and cultural attractions alongside a famed culinary scene and great sense of kid-culture, here are ten of the reasons why you might want to consider the Windy City for your next family getaway. Chicago Children’s Museum (Chicago, IL 60611) – Because there’s so much to do at the Chicago Children’s Museum, it might be wise to take advantage of the First Free Monday program, which allows kids under the age of fifteen free admission and extends the operation hours of the museum for the day. Budding scientists will get a kick out of the Inventing Lab, while dinosaur aficionados are sure to flip for the Dinosaur Expedition exhibit. Of the twenty-seven benches stationed inside the museum, only one plays music when you sit on it. Letting kids know in advance and presenting them with the challenge of finding it can make for an afternoon of fun all by itself! American Girl Place (Chicago, IL 60611) – Built around the universe created by the beloved American Girls books and dolls, American Girl Place is packed to the brim with accessories, clothing and memorabilia. There’s also a cafe, whose menu is heavy on the kid-friendly fare and features great desserts. Because the attractions within American Girl Place are in such high demand, it’s advised to make reservations for the theater and cafe well in advance. Shedd Aquarium (Chicago, IL 60603) – The Shedd Aquarium is the world’s largest indoor aquarium, also boasting an oceanarium that houses a variety of marine mammals. Coral reefs, sharks and a variety of other underwater marvels call the Shedd home, making it easy for your little ones to observe the wonders of the sea without a wetsuit. Museum of Science and Industry (Chicago, IL 60637) – Pretending to ride the Pioneer Zephyr 1933 train, taking a simulated tour through a coal mine and exploring a German U-505 Submarine are all adventures your child can have at Chicago’s Museum of Science and Industry. Be sure not to miss the Idea Factory and the ToyMaker 300, which are always a hit with the smaller set. Ukrainian Village Children’s Center (Chicago, IL 60622) – Kids between the ages of two and seven are welcomed at the Children’s Center, which offers a variety of arts and crafts activities throughout the day. While the Center does allow parents to drop older kids off for the day, they also welcome you to stay so that you can watch your little one have a creative blast. FireZone (Schaumburg, IL 60173) – Teaching kids about fire safety and satisfying the curiosity of youngsters that have a fixation on firefighters is the goal of FireZone, a themed center just outside of Chicago. Actual firefighters teach kids about how to prevent fire and how to stay safe if one occurs, but also bring kids aboard fire engines for exploration and direct them through firefighter activity stations. Lincoln Park Zoo (Chicago, IL 60614) – Lincoln Park Zoo, established in 1868, is one of the oldest zoological attractions in the country and a leader in community education and conservation. Perhaps best of all, you can visit Lincoln Park with your entire brood in tow for free! 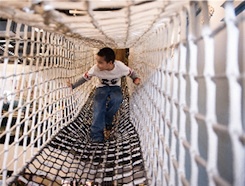 DuPage Children’s Museum (Naperville, IL 60540) – Three floors of artistic, scientific and mathematical exploration are packed with exhibits and interactive installations throughout the DuPage Children’s Museum. The Third Thursday program also encourages parents of autistic children to bring their youngsters to DuPage on the third Thursday of the month between five and seven in the evening for access augmentative communication devices and other resources. Garfield Park Conservatory (Chicago, IL 60624) – Aspiring artists will be overjoyed to find themselves inside a replica of Monet’s famed garden, while kids of all ages will have a blast in the Elizabeth Morse Genius Children’s Garden. Open year-round, this unique and exciting installation offers a completely interactive experience, encouraging young visitors to climb flower vines, peek inside mammoth seeds and help to pollinate a massive flower. Indian Boundary Park (Chicago, IL 60645) – If you find yourself and your children in need of a mellow afternoon for a bit of downtime, Indian Boundary’s lagoons, fountains, petting zoo and playgrounds may be just what the vacation doctor ordered. Because Indian Boundary is also a residency site for the Civic Orchestra of Chicago’s MusiCorps program, there are also free and family-friendly concerts offered onsite throughout the year. You’d be hard-pressed to find a child that doesn’t adore pizza; thankfully, Chicago is renowned for their deep-dish style pies. After a long day of trekking through museums, parks and shops, make sure you stop off for at least one slice. 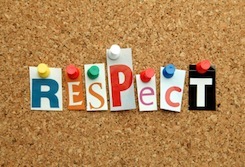 More than money, your nanny wants to be treated with respect. She wants to know that you trust and value her, and consider her an important part of your children’s lives. Respect your nanny by paying her legally, giving her the appropriate time off, treating her with kindness and letting her know when she’s doing a great job. Avoid minimizing her role, talking down to her and demanding she take on responsibilities that you haven’t agreed to. For nannies, there is hardly a thing worse than coming in Monday morning to a child who has totally regressed in potty training, or any other area, over the weekend. If you’ve agreed to potty train, take away the pacifier or move your child to his own sleep space, it’s important for everyone that you follow through. Oh, and those dirty dishes you left in the sink, your nanny hates those too. 3. Forgetting my paycheck is not okay. To nannies, asking for a paycheck feels like asking for a favor. The big difference is that your nanny has worked hard to earn her paycheck. Be sure to deliver your nanny’s paycheck promptly each week. Or better yet, consider using a payroll service that supports direct deposit. Doing so will make the business side of employing a nanny easier for everyone. 4. I question your priorities. When you tell your nanny you can barely afford her salary and then hire a high-end landscape company to install an irrigation system in the lawn, your nanny may wonder what’s more important: quality child care or green grass. When you complain that you miss your children and can’t wait to get home, then call her and tell her you’re going to be late because a friend invited you for dinner, she’s going to wonder what matters most. 5. I hate when you take advantage of me. Most nannies are more than willing to take on additional tasks from time to time. If your nanny sees that something needs to be done, like that mound of your laundry, she’s even likely to do it without being asked. If these occasional gestures turn into daily expectations, your nanny will feel like you are taking advantage of her and will resent you for it. 6. Disrupting the kids schedule because you feel guilty isn’t right. You’ve come home late and the kids are asleep. Because you didn’t get to say goodnight, you decide to wake them. They aren’t able to go back to sleep right away, don’t get a good night’s sleep, and the next day your nanny has to deal with the aftermath: extremely cranky, overtired and unsettled children. Before disrupting your children’s schedule or routine, ask yourself who really benefits. If it’s not your children, consider leaving things alone. 7. I have my own life and family. Your nanny is not part of your family. She has a life and family outside of yours that she is committed to. When you call her last minute to tell her you’ll be late, chances are that affects her plans and her commitments. When you call her on the weekend to see if she’s free so you can get some shopping done, you’re interrupting her. While most nannies will always do what they can to assist you, it’s often at the expense of their own family and friends. 8. When you don’t back me up it gives your kid permission to treat me like crap. When your toddler bites your nanny and you tell him it’s okay, or when your 8-year-old screams “She’s not my mother, I don’t need to listen to her” and you do nothing about it, you are sending the message that treating your nanny poorly is acceptable. By backing up your nanny, you send the message that she deserves respect. 9. If you don’t discipline your kids you’ll regret it. Many parents wonder why their children behave better for the nanny. It’s usually because the nanny has adapted a non-emotional style of discipline and is willing and able to follow through, even when doing so is inconvenient or hard. Working parents often feel guilty about leaving their children, so when they are with them, they overindulge them and refuse to “be the bad guy.” The result is children who walk all over their parents and treat them with no respect. 10. Money doesn’t buy love. All those prizes and toys you come home with mean little or nothing if they aren’t backed with real, genuine and unconditional love. Sometimes the kids want to snuggle with more than a teddy bear mom gave them. They want to snuggle with mom herself. Make time for your children. That’s what they want and that’s what they need most. The indomitable spirit of Atlanta helped the city to regain its collective footing after the Civil War, becoming a booming hub in the South. Known as the city “too busy to hate” during the Civil Rights Movement, Atlanta was able to retain its reputation as a culturally progressive beacon among other Southern cities of comparable size. The rich history, strong and diverse economy and number of interesting attractions have allowed Atlanta to land a number-seven spot on Forbes’ Most Visited Cities list. If you’re considering a family trip to Atlanta, this is only a small sampling of the many great attractions for kids and families. Fernbank Science Center (Atlanta, GA 30307) – Housing one of the largest planetariums in America, the Fernbank Science Center is a great stop for kids that have an interest in space and astronomy. The observatory also contains one of the largest instruments dedicated to public viewing and education, a telescope that patrons are welcomed to try out when weather conditions are satisfactory. Imagine It! The Children’s Museum of Atlanta (Atlanta, GA 30313) – Recommended for kids age eight and younger, Imagine It! The Children’s Museum of Atlanta features a permanent exhibit that covers food production from gathering to delivery, a water play area where brightly-colored raincoats are passed out to allow “fishing” with magnetic poles, and an art gallery that encourages painting on a washable Plexiglas wall. Yellow River Game Ranch (Lilburn, GA 30047) – Yellow River Game Rance, a twenty-four acre facility, is a preserve that’s home to more than 600 animals. Mountain lions, bears and buffalo are among the inhabitants. While predators and wild animals are contained, tame and calm ones wander as they please. There’s also a petting zoo area for kids, filled with barnyard animals. 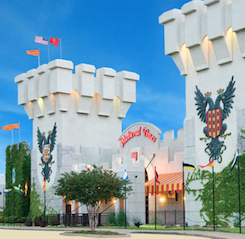 Medieval Times (Lawrenceville, GA 30043) – Few places offer the chance to eat dinner as knights joust in the arena overlooked by the dining room, but Medieval Times does just that. Cheer for your favorite constants, marvel at the elaborate costumes and enjoy a hearty meal in the mock castle, but be sure to make reservations in advance to ensure that you get a seat. Atlanta History Center (Atlanta, GA 30305) – From its humble beginning as a railroad town to one of the nation’s great cities, the history of Atlanta is displayed in an engaging and interesting way at the Atlanta History Center. Admission price covers the Museum, tours of two historic homes and entry to the gardens. The Tullie Smith farm, an 1840′s replica home, features costumed interpreters that explain everything from animal husbandry and basket weaving to candle-making and blacksmithing. Kangaroo Conservation Center (Dawsonville, GA 30534) – The largest collection of kangaroos outside of their native Australia is in Dawsonville, an hour’s drive north of Atlanta. Three-hundred kangaroos, along with several other exotic species, are housed on the premises. Tours, exhibitions and shows are among the available activities, but an advance purchase of tickets is required due to tour visitor limitations. Center for Puppetry Arts (Atlanta, GA 30309) – Kids that have a fondness for puppets are sure to love Atlanta’s Center for Puppetry Arts, which is the largest puppetry organization in the United States. The Family Series includes original adaptations of beloved classic tales, but there’s also a behind-the-scenes tour for those that are really interested in the art of puppetry. The Create-a-Puppet Workshop exhibit lets kids leave with their own custom souvenir, which is included in the admission price. Zoo Atlanta (Atlanta, GA 30315) – The private, non-profit Zoo Atlanta offers kids the chance to see a wide variety of animals in a semblance of their natural habitat, and also to watch a variety of exhibitions and feeding sessions. Zoo Atlanta does boast a renowned collection of great apes in The Ford African Rain Forest, a petting zoo that lets kids interact with barnyard animals in a more hands-on environment and a playground for fun between habitats. Tellus Museum (Cartersville, GA 30120) – Boasting more than 120,000 square feet, the Tellus Museum is largely comprised of four galleries. An eighty-foot-long Apatosaurus and a replica of the Wright flyer call the Tellus home, along with a digital planetarium and observatory. Margaret Mitchell House (Atlanta, GA 30309) – While young children may not be overly impressed, older ones that are familiar with Margaret Mitchell’s timeless masterpiece will love the docent-led tour of her house. Listed on the National Register of Historic Places, the building includes a restored version of Mitchell’s apartment and a a museum of Gone With the Wind-related memorabilia. Martin Luther King, Jr.’s childhood home is located in Atlanta, and is a National Historic site ideal for following up a visit to the The King Center. Dr. King’s grave is also in Atlanta, but may prove to be a bit morbid for younger children. For lighter entertainment, Atlanta is also home to three major professional sports teams: NFL’s Atlanta Falcons, MLB’s Atlanta Braves and the NBA’s Atlanta Hawks.